When you become more used to this, you can gradually increase the duration of the walks, jogging, whatever. It will be considerable progress if you can do your exercise for 30 minutes, 5 times a week. Allowing the body to gradually adapt to the strain and frequency of the exercise is the most important factor for people who haven’t been physically active in a while and those who have recently recovered from a medical condition or pregnancy. Hasting in training will only make you feel stiff and tired, which can discourage you altogether. When it comes to keeping fit and doing exercise, most people think of nothing but the so-called ‘active’ sports. They are generally associated with a lot of strength and strain which, let’s face it, isn’t quite for everyone. When considering certain activity, we often think about how time-consuming it will be, how to fit it into our schedule, the kind of sports gear we’ll need and so on. Sometimes, one of these conditions is enough to turn us off if we’re not quite willing to keep up with it. On the other hand, if we look upon sport as an awaited leisure activity, extra free time for ourselves or an investment in our own well-being, we may be more successful. We can even draw greater pleasure out of sport if it shared with a special person or a close friend. You can only be happy and satisfied with certain physical activity if you are really fond of it. While some people want to try nothing but the gym, others fall for badminton, a trampolining session or a salsa class. Whatever you choose, have fun doing it! They key to being consistent in training over time is in motivation: when the activity that you’re doing is enjoyable, you’ll want to return to it over and over again. So, folks, if you’re not quite keen on sports centers, just opt for whatever you’ll like and keep going! Before you actually pick up the sport to follow, pay attention to this. An outdoor activity will promote your mental health and wellbeing apart from preserving your physical form. This does not really hold for sports practiced in a closed hall, such as aerobics, step or dance classes. Spending more time outside, in a natural environment, will even make you feel more relaxed and cheered. You have surely heard about the capacity of green colour to appease anger, anxiety, tension, depression and fatigue and to give rise to a surge of energy instead. So, work out ways to spend more hours among greenery. Increasing the hours spent outside can have favourable effects on weight, too. Women with average weight (10 stone 3.5 pounds) can get rid of some 130 calories with 30 minutes of brisk walking. Along with stabilizing your weight, this type of activity can also manage body fat, better your heart’s condition and fight osteoporosis and type 2 diabetes. 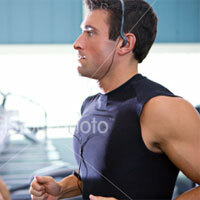 If you’re a little bit more trained, proceed with a more strenuous workout, such as half an hour of jogging. Experts in the field assure that two and a half miles of jogging burn off 261 calories and the same distance in cross-country running eliminates as many as 2945. If you’re a fan of rollerblading, establish a routine of 30 minutes per day and you’ll lose some 228 calories. Cycling at 12 to 13.9 miles per hour will help you get rid of 261 calories and greater speed (20 miles per hour, for example) will double the burnt off calories to 522. Dancing classes are gaining more and more popularity these days. Today, a variety of them are offered in local clubs and studios. You should know that dancing, apart from being a relaxing activity for the leisure time, can also keep your muscles fit and toned. You can choose to dance with a partner, as in salsa, swing or ballroom. If you wish to do it on your own, go street style with funk, hip hop and jazz dance. Dance classes are an ideal opportunity to mix with people and socialize. You can even make new friends. This will boost your mood and make you feel happy. In terms of physique, you’ll have your heart rate sped up and the muscles of your legs tightened. Something major happens late in the day that could cause serious problems at work or at school. The good news is that the issue should be extremely short-lived, so don't panic about the future. Your popularity could take a hit today -- but it's actually for the best! Something you said or did was essential, even if almost nobody likes it. It can be hard to be this responsible, but someone has to do it! It's a slow day -- and not just for you! Lots of folks around you seem to be taking their time processing information and waiting to see what others do before taking action or voicing opinions. Try not to just go along for the ride today -- you need to know precisely what you're in for before you can consent. Your energy is strong, so insist on answers until you are deeply satisfied. Your ego gets a little bruised early in the day, but you should be able to face tomorrow with a clear mind. Don't sweat the small stuff, and try to make sure that your friends have got your back.